“The process itself is always fun and non-judgmental. We do the concerts simply because we enjoy them and we enjoy each other… Working with people I am so close to has been an experience unlike anything else I’ve had with other companies,” shares dancer Dona Wiley of her experiences with CelloPointe. It’s always wonderful to hear when company members truly enjoy working with each other and it’s even better when they form close relationships, but in this unique company most of the performers couldn’t have become much closer than they already were – some of them are related. CelloPointe, founded in 2010, boasts the collaboration of the Wiley family: Peter, Marcia, David and Dona. Siblings David (cellist) and Dona (dancer, former cellist) perform with their father Peter (Grammy award-winning cellist) while mother Marcia (also a cellist) takes on a managerial role. The whole family grew up playing cello together in the home and at student recitals. When Dona turned her focus to dance, the family continued to play for some of her shows and at the studio. 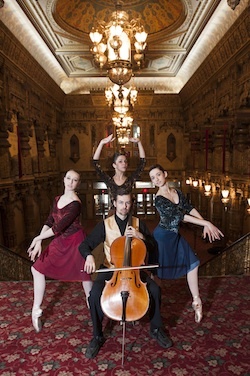 CelloPointe cellist David Wiley with dancers Claire Mazza, Kate Loh and Dona Wiley. Photo by Mike Fitelson. “The two passions in our family are music and dance,” says Marcia, the dance aspect going all the way back to Peter’s time as a student at the Curtis Institute of Music, when he played cello for the Pennsylvania Ballet. Since then, their work together has evolved into accomplished professional performances. It isn’t always easy working with your family, let alone growing up with them! “Dona and I probably bickered and fought as much as any other siblings growing up.” But, David says, working with his sister has shed light on the hard work that dancers go through to produce something worth seeing. “I’ve always seen Dona’s dance career from the outside looking in. CelloPointe, however, let me see … how much work and how many hours they put into these elaborately choreographed works. Seeing her in this aspect of CelloPointe makes me respect her as a dancer and an artist.” And now, the siblings are best friends. Since 2012, Kate has had the opportunity to work with choreographers such as Deborah Wingert, Gabrielle Lamb and Emery LeCrone, each of whom brings a unique perspective to their choreography with a ballet foundation. Peter and Marcia found it interesting that this year Wingert, the most classical of the choreographers, ended up choosing a very modern piece of music by George Crumb, while Lamb, she with the most modern background, chose Vivaldi. Such variety has always been a part of their programming, which aims to attract both music and dance audiences. CelloPointe’s Peter and Dona Wiley. Photo by Sherryl Hauck. Among the group of highly acclaimed emerging guest choreographers working with the company this season is Marcos Vedoveto. As an emerging choreographer, he has created new works for the Latin Choreographers Festival (NYC), Dance Theatre of San Francisco and Connecticut Ballet, among others, for which he blends classical and contemporary themes. 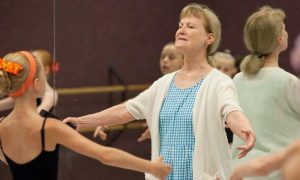 While at Connecticut Ballet, Marcos met Dona as well as CelloPointe dancers Claire Mazza and Morgan Stinnett, a connection that would bring about the creation of a new work. “I am choreographing a piece about the three graces, not really telling the story about them but of a frustrated painter who has no inspiration to paint anymore.” And, yet somehow the artist ends up painting the three muses, which seems fitting for a company in which the artists are inspiring the art in each other. 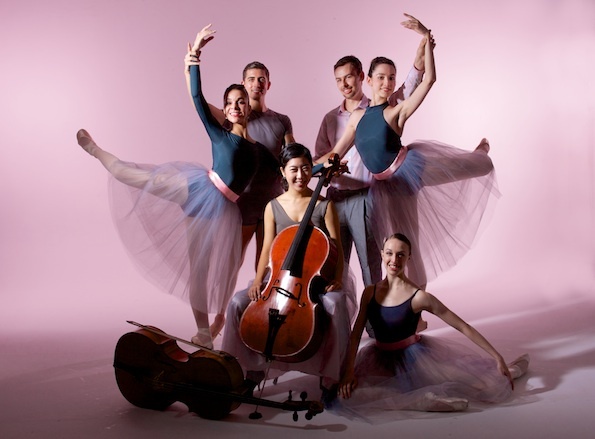 CelloPointe just performed at the Ailey CitiGroup Theater in New York City on March 2, and are now preparing to perform at the Chamber Music Northwest Festival in Portland, Oregon on July 4, 5 and 6, 2014. For more information, visit cellopointe.com. Photo (top): CelloPointe. Photo by Jaqlin Medlock.